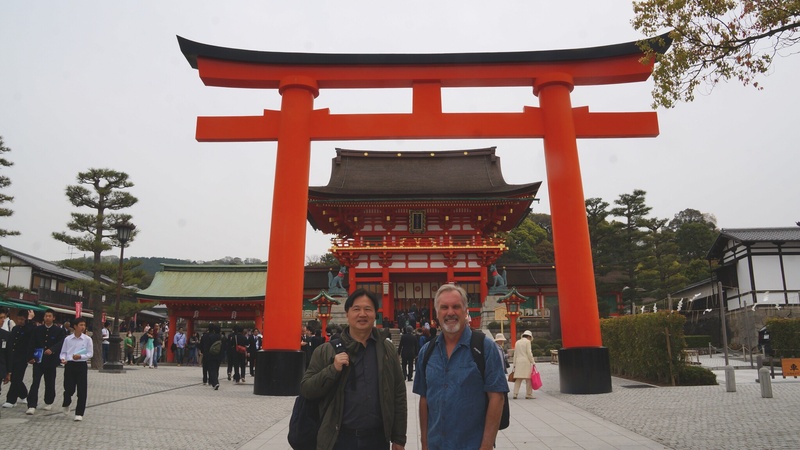 We took the train today from Osaka back to Kyoto and exited at the Inari station to visit Fushimi Inari-taisha, a very important Shinto shrine dedicated to Inari, the God of rice. How convenient that the train station is right across the street from the entrance to the shrine!! Like many shrines, this one had an impressive entrance with a giant torii gate front of the main shrine. To the left and right are several additional support buildings to the shrine. How lucky we were to see a Shinto priest chanting as we passed by. 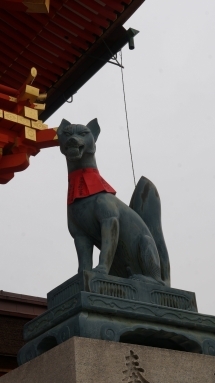 Foxes are believed to be the messengers for Inari, which is the reason you’ll find many foxes on the grounds, holding a key to the rice granary in their mouths. 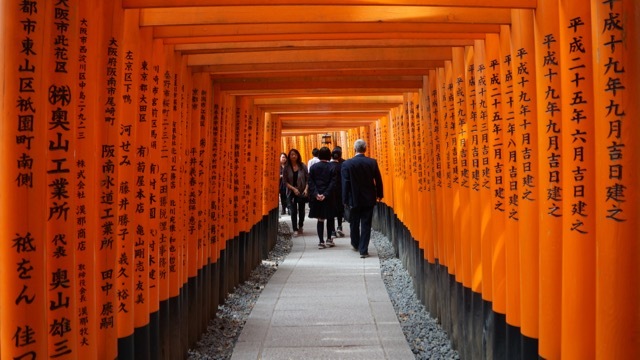 I think the main reason people come to this shrine is to hike the beautiful torii gate lined trails into the mountains, which start with two densely lined rows of gates called “1000s of gates” in Japanese. The gates, which line the entire trail, are donated by companies with the donator’s name and the date of the donation inscribed on the back of each gate. The cost starts around $4,000 for a small gate up to $10,000 for the large ones. The hike to the summit usually takes 2-3 hours, but if you’re an avid photographer like me, it will take you much longer. The road is paved all the way…some parts are more level than others, some parts quite steep, and the torii gates get less dense, but there are restaurants and snack shops to rest along the way where you can grab a bowl of noodles or an ice cream, and stop to enjoy the view. 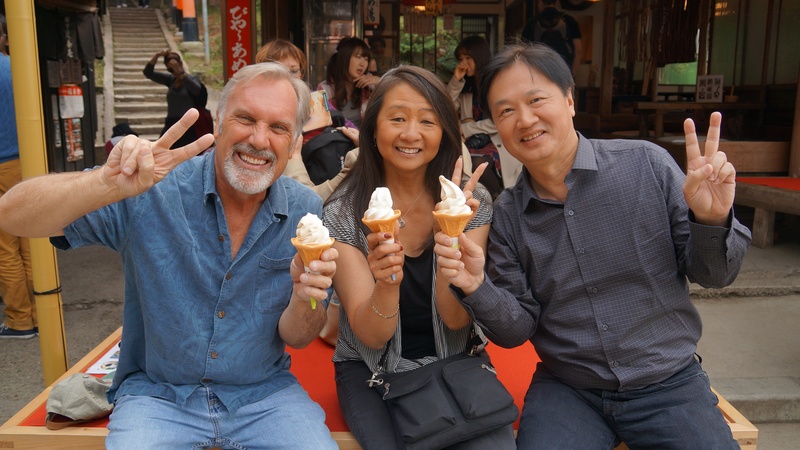 Chuck, Yol, & Ken taking a hiking break with ice cream! Trying to to get photos in this beautiful place without a lot of other people takes some effort. As you can imagine, this is a beautiful peaceful place, visited by many. The higher you go, the fewer people there are, and waiting to get the right shot gave us a chance to rest!! It was another wonderful day of hiking in the mountains beneath these beautiful gates in this serene and peaceful environment.